For years, science fiction writers have tackled the scenario of rising sea levels, envisioning disastrous waves that destroy cities and cause social upheaval. But in his latest book, New York 2140, author Kim Stanley Robinson imagines how the metropolis and its inhabitants would adapt and thrive in the new environment. He joins Science Friday to discuss the technological, economic, and social structures that would help us survive sea level rise. Read an excerpt from New York 2140, by Kim Stanley Robinson. IRA FLATOW: This is Science Friday. I’m Ira Flatow. For decades, science fiction writers have tackled the theme of apocalyptic sea level rise– disastrous tides overtaking coastal cities, destroying homes and infrastructure, forcing residents to abandon once-thriving metropolises with civilizations barely hanging on. My next guest has explored the idea in his past books, like 2312 and the series Science in the Capital. And in his latest novel, Kim Stanley Robinson drowns– submerges New York City under 50 feet of rising sea level. But instead of a complete breakdown, he takes an optimistic view. The city and its residents have learned to adapt and actually thrive in the rising waters. He gives a glimpse of daily life. If you’ve ever spent a hot summer in the city, you can imagine the stench of 50 feet of standing water in the sun. And he also details what technological, economic, and social structures, business structures, we would need to survive sea level rise. Oh yes, it is also a tale of mystery and intrigue. 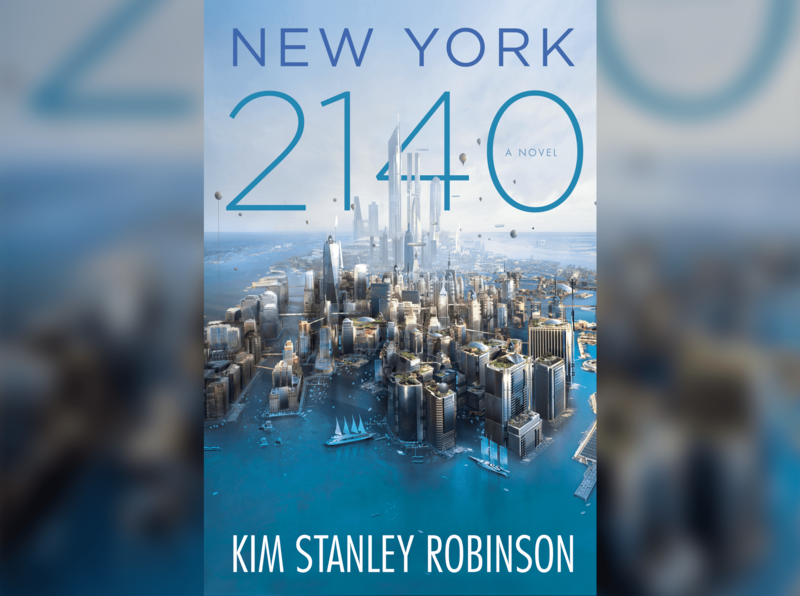 Kim Stanley Robinson’s newest book is called New York 2140. He joins us today to talk about it. Welcome back to Science Friday. KIM STANLEY ROBINSON: Thanks Ira. It’s good to be back. IRA FLATOW: Good to have you back. Let me give out our number, 844-724-8255, if you’d like to talk about the book– 844-SCI-TALK. You can also tweet us, and also you can listen online at sciencefriday.com. What made you decide to submerge New York under 50 feet of sea level rise here? KIM STANLEY ROBINSON: Well, I thought it’d be interesting, and we are going to have sea level rise, so it’s not an unlikely scenario. And I wanted to write also about global finance and kind of a revolution against global finance, and so setting it in New York with Wall Street under water, it all kind of made sense. IRA FLATOW: Yeah, and the last time we talked, if I remember correctly, was about your book Aurora, and you told me you were taking measurements around New York City, I guess to figure out where the ocean would rise to? KIM STANLEY ROBINSON: That’s right. There’s a USGS topo map of Manhattan that includes all the streets but also the contour intervals of what the elevations are. So I got one out and marked 50 feet, which is somewhat arbitrary, but what it did was it got Downtown under water all the time, and parts of Midtown are a tidal zone that’s pretty broad, where at high tide it’d be underwater and at low tide it’d be exposed. So it was a fun project to walk the city and do that. And I want to add that, of course, floods of this level would be a monumental disaster and a bad thing, but what my book points out is that after that happens– and some version of that is going to happen– people will continue to cope. And New York is a place that people aren’t going to abandon. So the coping is going to be interesting. IRA FLATOW: So it’s sort of like– it’s been described as a super Venice in the book. KIM STANLEY ROBINSON: Yes. Venice was an important model for me. I’ve been to Venice four times through the years and been fascinated by it most of my life. And when you’re there, you see that a city can function with canals instead of streets and without any cars. And in some ways it’s quite beautiful, like a work of art where you have to cooperate with a tidal zone. It’s weird– there’s no doubt about it– but interesting. IRA FLATOW: Are there any little, I guess, little Easter eggs in the book– visual jokes in there that we might recognize, for those of us that live in the city? KIM STANLEY ROBINSON: Well, I have all my characters living in the oldest Met Life Tower, which is down on Madison Square, built in 1890. And the reason I chose that building is that the architect of that building, Napoleon LeBrun, modeled it on the Campanile in San Marco Plaza in Venice. So essentially, we have a Venetian bell tower there in the middle of Manhattan, and it seemed like the right place to put my people. IRA FLATOW: It does look just like it. KIM STANLEY ROBINSON: It’s been modeled on it, yeah. IRA FLATOW: In the book, people are living in these self-sustaining communal skyscrapers, as you say, that are being battered by water. What are some of the techniques that you had to install in these buildings to make them still survive this building to make them work? KIM STANLEY ROBINSON: Well, taken out of ordinary skyscraper construction and also Venice itself, you would need to give up on the floors that are in the tidal zone, and they become kind of a combination of wet storage and a boathouse, really. And then above that, you have to have your power, and photovoltaic power, skyscraper farms, water tanks as in New York already– everything would have to be shifted and used in ways that would be adapted to a kind of a Venetian context. New York is an estuary, and there’s already a lot of New York infrastructure that has to deal with being under water, so it would be an extension of what we already do. IRA FLATOW: Let’s see if we can go to the phones, 844-724-8255. Let’s go to Omaha. Braden, hi. Welcome to Science Friday. CALLER: Hi. I was wondering that if the sea level rised high enough, and takes– how long would it need for it to get back down? KIM STANLEY ROBINSON: Oh, that’s a great question. Sea level rise– we don’t know how fast it can go because it depends on ice sliding off of Greenland and Antarctica. That’s how it would happen. If all the ice on this planet were to melt, sea level would rise by about 220 to 270 feet, so that’s considerable. And in my book I only portray 50 feet, which would take a few hundred years. Now you ask how long would it take to shrink that back down. There’s actually an institute in Germany that has investigated pumping water back onto the top of Antarctica and letting it freeze there. You would have to take about 20% of all the electricity that humanity generates right now, and you would have to have about 60 essentially oil rigs– pipelines– scattered around Antarctica, working in the summertime only, using solar power so you don’t burn more carbon doing this, and then it would take you about– if you started right at the beginning, you could hold it off forever. But if you were recovering a situation, it would take about as long as it took to flood. In other words, maybe about 100 years. IRA FLATOW: Hm. In fact, in your book you describe that the flooding didn’t happen all at once– that there were three different pulses or floods that happened. Did you calculate how these would happen on real environmental events that are going on? How did you decide that’s the way it would happen? KIM STANLEY ROBINSON: It’s an extrapolation of how glaciers move. Usually they’re frozen to the rock under them, but if they get onto a layer of water, then they’re like on skimboards and they slide quickly. So there’s a slide-and-stop movement to ordinary glaciers. Last year, James Hansen and 18 co-authors published a paper where they calculated what sea level had done 120,000 years ago, which is like with a one-temperature rise of average global temperature– which we’ve already done– there was about a 10-meter sea level rise in a single century, and it was mysterious. And what Hansen and his people postulate is that warmer oceans circulating around Antarctica release glaciers that are perched over the water and only held in place by dams that are made of ice itself. So as soon as warm water gets underneath those dams– and in one phrase that I love they call it the buttress of the buttress– then you get a sudden slide. So what I was postulating– and really this is very science fictional– I’m just guessing– is that things would go fast for a while and then stabilize for a while, and then maybe go fast again. IRA FLATOW: Mm-hmm. Let’s go to Georgia– to Wayne in Georgia. Hi Wayne. Welcome to Science Friday. CALLER: Happy to be able to say anything. I was just wondering about what would happen with the transit system. As you said, Venetian and whatever– avenues to be able to get around. With the Big Apple being so dependent upon the transit system and everything, what would happen to that? Would it be submergible? Or what would happen to all the transit systems that gets people around in this very populated metropolis? IRA FLATOW: Yeah, good question. What happens to the subways? KIM STANLEY ROBINSON: Well, the subways drown when they’re under water. And about 60% of New York subways are underground and would be drowned and would be used, I suppose, as utilidors with essentially automated submarines– like these automatic cars that you were talking about in the last segment– moving stuff around, but not people. Then you’d get around on the surface like they do in Venice– in boats. The buses are vaporettos. And I suppose in New York you could set skylines, like the High Line over in Manhattan’s West Side, where you could walk above the water level in new kind of balconies or corridors. It would be hard. It would slow things down. It would be an impaction. And also, you have to remember that global trade depends crucially on container ships. The entire global economy depends on ports, and when they’re drowned, you would have a massive disruption of global trade, and in essence, a worldwide depression in economic terms. Extraordinarily disruptive. So I don’t want to misrepresent the situation. Sea level rise would be a stupendous disaster that some people calculate would cost like $1.5 quadrillion. That would be $1,500 trillion. And I think that’s actually too low, because world trade is what we now rely on for food and all of our goods. It would be extraordinarily disruptive– the transport problem. And also, if you don’t want to burn carbon, I think you go back to sailing ships and dirigibles, and so everything slows down and becomes more labor-intensive. But people need jobs, and once you have slowed down, you might find that you enjoy life more and you have more meaningful, full employment, so there are compensations. IRA FLATOW: In deciding the fate of New York– people always talk about, let’s bring over the Dutch. We’ll build floodgates, things like that. But you chose to portray the city as flooded– not being able to keep out the waters. Why did you go in that direction and not into trying to build dikes or dams or things or floodgates? Do you think it’s not a viable option? KIM STANLEY ROBINSON: I don’t think it’s a viable option. New York is a gigantic estuary, and when you think about the water that’s pouring down the Hudson, which is absolutely a big watershed. You have both the Verrazano-Narrows and then you have Long Island Sound through Hell Gate. Where would you put these dams or barriers, and what would you try to stop? And what if it failed? So right now the current plan– and it’s quite an interesting one– is to build a barrier all the way around the south end of Manhattan, about 12 miles long, that would protect Manhattan from the kind of surges that we’re going to be seeing really soon. Studies are being done, and they want to do this without disrupting the ordinary flow of Manhattan traffic and people. And it looks like it might be doable. But what my book portrays is the moment when sea level gets too high– when a barrier is overwhelmed, then you get a disaster. So it may be better just to let the estuary flood to its normal levels, whatever they may be, and then cope with it from there on. IRA FLATOW: And doing all of this costs– and moving the population and building of– you talk about it being flooded basically from 42nd Street down to Battery. And The Bronx is the new area where people are discovering– or have rediscovered. And the financing for this– have you thought about what it takes to finance this tremendous change in the economy? KIM STANLEY ROBINSON: Well, yes. Essentially, the economy as such would become about adapting to the new circumstances, so, in other words, the work of civilization. We would have to find ways to pay ourselves to do the necessary work of adapting to a different sea level, but also a different climate. This is already going to be happening to us, so what becomes interesting is calculating a new way of assigning value to our activities– in other words, paying ourselves to do the stuff that we have to do to survive. That isn’t how the economic system works now. We always count these things as losses, but if it actually employs people and you end up doing new construction, it’s kind of an infrastructure project is what it comes down to, but designed to adapt to new conditions. One thing that bothers me, as a kid from Southern California, is all the beaches in the world are doomed. And that’s true– not just a science fiction story. A sea level rise of a trivial amount like 5 feet will destroy all the beaches in the world. And that’s sad as well as bad. And what I’m thinking is that we may begin to try to become beach builders, and at the higher sea levels that we will have created, we may try to shift sand up and see if we’re good at doing ecology of the coastal regions. About 10% to 20% of the world’s populations live on the coasts. A lot of agriculture is on the coast and, of course, aquaculture is based off of the coasts. All of these things are going to have to be dealt with in the real world. So my story focuses on Manhattan because that’s an interesting and beautiful place and important, but it’s not the only place that matters. It’s just a sample of what’s going to have to happen. IRA FLATOW: Talking with Kim Stanley Robinson, author of the new book, New York 2140, on Science Friday from PRI, Public Radio International. Really interesting book. You’ve opened lots of different stories and ideas in there, and you’ve taken on a lot of different issues, including sort of attacking the business community, saying that we really need a whole new way of doing business. And not to give away any spoilers, but it’s about sort of bringing down the whole business system. KIM STANLEY ROBINSON: Well, let’s talk about global finance as being kind of a parasite on what some people call the real economy– so the financialization of our lives, where money is made out of the manipulation of money. We saw how that can impact the real economy in 2008. So a lot of my books’ financial plot comes out of an alternative response to what happened in 2008. We nationalized GM at that point– got it back on its feet– but we actually just gave money to the banks and investment firms that had crashed the economy. And we gave them 100 cents on the dollar and told them not to do it again, and they proceeded to go back and do their best to do it again. There will be more bubbles. There will be more bubbles bursting. So at that point, I think we need a plan like the nationalization of General Motors, but that we nationalize the banks, and that finance itself becomes a public utility– perhaps privately run, but publicly owned– a public utility district– finance itself. Well, this is shocking and revolutionary, et cetera, et cetera, but it’s also not that different from the way things have worked at various moments in history, where the Keynesian balance between government and business sort of favored government. So it’s a story to tell, and it’s a way of responding, I think, to the crisis of the 2008, 2009 crash. We need to do better next time. So I try to tell that story too, as a kind of Utopian comedy– a comedy of the commons, a comedy of climate change, and a comedy of disaster. It doesn’t immediately suggest itself, but it’s a new story to tell. IRA FLATOW: We’re going to take a break– come back and talk lots more with Kim Stanley Robinson about New York 2140. I want to do a couple of shout-outs. I want to tell you that he’ll be joining us to talk about his newest book next week, Monday, March 20, at Housing Works Bookstore in New York. If you’re in the New York area or in New York City and want to hear more, or you want to meet Stan in person, ask him a question, get your tickets at sciencefriday.com/bookclub. As I say, that’s going to be March 20, next Monday at Housing Works Bookstore. You can go to our website at sciencefriday.com/bookclub. We’ll be back to talk lots more with Kim Stanley Robinson about 2140, take your questions. Our number, if you’d like to chime in, is 844-724-8255. You can also tweet us @scifi. We’ll be right back after this break. Stay with us. This is Science Friday. I’m Ira Flatow. This hour we’re talking to author Kim Stanley Robinson about his latest novel about rising sea levels called New York 2140. Before the break, I talked about Stan being at a book club next week. It is March 20, but it’s at the Strand Bookstore– the Strand Bookstore here in New York City next Monday. Tickets at sciencefriday.com/bookclub. So how many people want to talk [LAUGHS]– go to the phones. You mentioned New York City and you mentioned the beaches. You’re from California. Somebody said– a tweet from Bianca who said, “Would San Francisco be part of this kind of sea level rise?” And I guess, as you say, you just chose New York as an example, but it would be occurring all over the world. KIM STANLEY ROBINSON: Yes, it would, and you can look at your nearest coastal city and kind of estimate just by thinking about a certain sea level rise, say 50 feet. San Francisco is hilly, and a lot of it would not be affected, but, of course, down near the water it would. Miami would be– not just Miami, but much of Florida would be under water, and every coastal city has a different relationship to the ocean. There are cities that have a waterfront, like Chicago, that wouldn’t be affected at all. So it’s an odd scenario to explore the nooks and crannies of an interesting– but what I guess I want to say is that sea level is going to happen, so it isn’t just a game that you play. It’s a kind of scenario of possible futures so that you can begin to prepare your thinking. IRA FLATOW: So you wouldn’t agree with the President’s budget director, Mick Mulvaney, who said yesterday that climate change would be– climate change research funding– it would be a waste of money? KIM STANLEY ROBINSON: No, I wouldn’t agree. I’d say that’s very heavily discounting the future generations– basically a Ponzi scheme that cheats the future generations who will be left holding the bag if we wreck things. It’s the best investment we can make to actually prepare for a climate change future, because that’s what we’re actually heading into. IRA FLATOW: As they used to say in the ’60s, we’re borrowing our grandchildren’s future today. KIM STANLEY ROBINSON: Yes, and you don’t want to trash it. You want to add value. IRA FLATOW: Now let’s go to the phones. Let’s go to Washington DC. Hi Jim. Welcome to Science Friday. CALLER: Hi. Yeah, my question is, what factors did you research that would incentivize a city like New York and the people there to build on top of the water or adapt versus just moving inland or moving uphill, and how might that be different in other locales across the country? And how might that inform us going into the real future here? IRA FLATOW: Yeah, good question. KIM STANLEY ROBINSON: That is a good question because everybody would make their own decisions. And refugee populations– if you’re talking about a tenth of the world’s population that is forced to make a change, a lot of them will move inland. There’s no doubt about it. It’ll be easier and more survivable– more food, more housing. Right at the coastline itself, it’s going to be trashed for a generation or two. And some coastal areas I imagine will be abandoned, and there will just be a new coastal area that is miles inland. But New York is different. It’s got a really intense infrastructure already there with skyscrapers that have steel supports right down into the bedrock. They’re not going to fall over if sea level rises. They’re going to be sticking out of the ocean or out of the tidal zone. And then after squatters, there will be new arrangements. It’s legally ambiguous. Land that’s under water doesn’t have the same legal status. It might not be property and yet the buildings will be there, so it gets very curious. But I think of New York as so charismatic that a certain number of people will stick around or come back. And it’s a joke in the book, but a lot of people get by in New York by living in such terrible places already, that you drown the place, and for some people it won’t make any difference, or for some people it will be an upgrade. IRA FLATOW: Yeah, some people living on the roof. That’s how it starts out with two guys on the roof. What about the new idea that you float in your book, I guess, is creating floating islands– new real estate on floating little islands hooked together, wired up? KIM STANLEY ROBINSON: I think that will happen in the coastal zones, and I think Holland is– of course, the Netherlands– they’ll be in terrible trouble, and they already have had dikes protecting their country for centuries. They have to think new– and they are– and they’ve had these suggested kind of– essentially island cities that are floating around in the ocean. If you were to anchor them to certain blocks in New York– there’s a huge distinction in Manhattan that you can see with the naked eye from Hoboken. Where you can put a building into bedrock, you’ve got skyscrapers. Where you’ve got landfill, you can’t build skyscrapers, and that’s where you got the low zones of Midtown that are only three, four, five stories tall. That’s not an accident. They’d build a skyscraper there if they could, but they can’t. If that area was flooded, those buildings would tend to melt into the drink, as my characters say. Now at that point, if you could anchor a raft that is the size of a Manhattan, New York– Manhattan block that was stuck in place and on stretchy cords so that it could rise and fall with the tides, you might be able to build a three or four-story houseboat that would fill a block and so adapt. And so this is kind of the game of science fiction, but humans do this too. How do you adapt to a situation where things have changed? What kind of ingenious workarounds will you come up with? And so that’s one of the things that I wanted to do in this novel is have some fun with the idea, as perverse as that may sound. IRA FLATOW: You also have a woman who flies around in dirigible moving animals from one place to another. They’ve been flooded out or it’s too warm for them, and especially the polar bears. And you have an experiment with trying to move polar bears to Antarctica because there’s no place for them. There’s no ice in the north anymore. It doesn’t go so well. KIM STANLEY ROBINSON: No. This is a kind of shocking notion. There is in the biology community a thing called assisted migration– which they feel is probably better called managed relocation– where when climate change changes the ecological conditions such that species are going extinct where they are, you could perhaps move them– mostly latitude lines, north or south– to get them back to a zone where they could survive. And what this is trying to do is dodge extinctions. Well, the polar bears are in big trouble. The Arctic sea is getting warmer– the sea ice goes away. Polar bears depend on it. Antarctica is completely different because it has a stack of ice that’s two miles thick and the ice will last there much longer. However, polar bears don’t exist down there. So it would be the introducing of a top predator to an area that isn’t used to it, and there would be a lot of environmentalists, or you might say wildlife purists, who would probably object to it. But if it’s a case of survival, of avoiding extinction, people might do it. IRA FLATOW: I was surprised to hear that none of your characters are scientists in this novel. You talk all about climate change and the changes, but there are no climate scientists in this book. There are in your other books. Why not in this book? KIM STANLEY ROBINSON: Well, I’ve done that before in my Science in the Capital, and I guess this is a change of emphasis for me. The scientific community is doing their best to alert us to the problem and to suggest solutions. The rest of us are a little bit behind that curve, and it’s time for a new story to be told that– how are we going to pay for it– this necessary work? So you get the finance. And then also what I’m enjoying is the idea that in my New York novel, it’s actually just an ordinary New Yorker. Sounds like a guy to me– a sports fan, fairly cynical, profane, somebody ranting– who knows enough to tell you the backstory– the scientific angle even– the history of what happened to New York. So in the place where I usually have scientist characters explaining things, I have a crazy New Yorker grabbing you like the Ancient Mariner and ranting about what happened, and it’s just funnier. KIM STANLEY ROBINSON: Thank you. IRA FLATOW: –see and talk to Kim Stanley Robinson, who’s joining us about his book, New York 2140, we are hosting a live talk with Stan this coming Monday, March 20, at the Strand– the very famous Strand. So if you’re in New York and you want to hear more, or if you want to ask Stan a question in person, get your tickets at sciencefriday.com/bookclub. That is next Monday– right after this weekend– next Monday, March 20, at the Strand, at sciencefriday.com/bookclub. We’ll see you on Monday, Stan. Take it easy. Thanks for joining us. KIM STANLEY ROBINSON: Thanks. Yeah, I’m looking forward to it. Thanks Ira. IRA FLATOW: It’ll be great. Author Kim Stanley Robinson imagines a version of New York City that's swamped by sea level rise. Join us for a live conversation about climate change, fiction, and New York in the year 2140.